By the summer of 1949 there was no shortage of newcomers to the rock field, all hoping to cash in on the seemingly insatiable appetite of its listeners for more and more raucous music that spoke loudest to their sensibilities. Unlike a year ago when so many of the recent arrivals were straddling the stylistic fence, or were headed towards rock’s outer regions more out of a sense of commercial desperation than genuine artistic interest with their efforts intrinsically compromised by their lack of belief in the music’s appeal and long term viability, the crop of rookies in 1949 seemed to need no convincing that this style was where they’d become stars. They all didn’t reach stardom of course, few ever do in professional music where the odds of a hit record are impossibly long to begin with and the chances at some form of historical immortality are longer still, but even those from this point forward whose output drew comparatively little notice, the authenticity of their work and the whole-hearted enthusiasm of their efforts can hardly be questioned. Such is the case with today’s first time contestant in a failed bid for rock stardom, J. B. Summers, yet another artist shrouded in mystery and generational neglect who nevertheless laid down a string of tough balls-out rockers while backed in the studio by a handful of bigger names along the way, all of which got him exactly nothing. I suppose the title of this record, Stranger In Town is oddly appropriate considering that Summers career, and life itself, remains largely in the dark… a true to life stranger in the town of rock ‘n’ roll as it grew into a thriving metropolis by mid-1949. Equally obscure is saxophonist Eddie Woodland who was actually the contracted artist for this session cut on May 26th, though Summers wound up getting the lead label credit on Gotham 186 when it was released in July, with Woodland being given secondary credit there, but full credit for Jumpin’ With Pio, the instrumental on the flip side. A stupid decision all around and so finally coming to their senses and realizing their best chance for long term success was by splitting the artists off onto their own releases, both sides was re-issued a month later with new B-sides – Summers on Gotham 190 and Woodland on Gotham 194. With those convoluted machinations out of the way we can focus on the man in the spotlight today and tell you with absolute certainty that whatever his upbringing and musical background may have been J. B. Summers entered the recording studio for the first time a rock ‘n’ roller through and through. In fact as rock artists circa 1949 go he’s almost a stereotypical model taken right from the showroom window, from his raw lusty voice to his full-throttle delivery and his enthusiasm at conveying the uninhibited sentiments of the song. In truth he sounds more convincing than even some of the founding fathers of rock (and biggest stars to date), as at times Roy Brown, Wynonie Harris and Amos Milburn all tripped up slightly in their approaches. Of course one side of one record is hardly anything to be judging long-term prospects on and mortgaging your house on the outcome, but listening to Summers wail without restraint from the word go on the thoroughly up-to-date sounds pouring out of the speakers on Stranger In Town you’d certainly have reason to lay down at least a couple of bucks that he’d be scoring hits in this field in short order. So why then haven’t we actually heard the name J. B. Summers? Well I guess being fully qualified for the role isn’t the only factor in your success… sometimes you also need a little luck. The record kicks off with Summers already in high gear, shouting out news of his arrival, literally in the song itself where he’s portraying someone new to town who’s available should any women care to “claim him”, but also figuratively where he’s new to the record buying public and wants to make sure they know where to send his mail, namely the rock ‘n’ roll town square. Everything he needs to establish himself as a star is present. He’s so confident in the way he cuts loose that you’d think he was riding back to back hits already, not making his first appearance on wax. His voice is strong, slightly weathered but still vibrantly young sounding (this was no bluesman or big band jazz singer moonlighting on the side for a few dollars) and he’s already mastered all of the relevant vocal tics to give him the stamp of approval as to his legitimacy in this field. He’s also fully aware of how to ride the rhythm of the backing music which provides him with a solid back-beat courtesy of the drummer who is thankfully avoiding the still prevalent jazz-inspired technique of focusing on cymbal work, as this is kept locked in on the snare and bass. Woodland on sax is also serving up steady company, churning alongside with a sense of purpose. That’s the platform that Summers hops aboard with confidence and lets fly. His cadences are right, his emphasis falls upon the proper points lyrically as well as in regards to the music, and best of all his attitude drips from every pore of his body. The song’s story line is a simple one, the narrator saunters into a new scene for him and immediately wants to make his presence known. He’s a good looking cocksure ladies man, dressed sharp with a wad of bills in his pocket who’s out to have a wild time. He’s eager, a little overeager maybe, but has no doubts that he can back up his boasts. There’s a good deal of Wynonie Harris in his persona, and to a degree in his vocal chords as well, intermittently at least. He doesn’t quite have the ribald undercurrent that Harris injected into nearly everything short of The Lord’s Prayer, but Summers unquestionably possesses a natural swagger that is inviting rather than off-putting. You get the sense that he’s the kind of guy who’ll make friends with everybody at the bar, not just by picking up the tab for people he just met, but by engaging with them in any and every topic that comes up, a smile on his face and an enthusiasm for life that can’t help but be endearing. His goal isn’t finding a handful of drinking buddies however, even if that’s probably inevitable by the sounds of his basic itinerary, but rather he’s seeking a girl. Not a girlfriend necessarily, certainly not a wife, but maybe someone more than a one night stand (though when meeting prospective candidates there’s bound to be a few umm… interviews… which will last one rather long and exhausting night). Now the fact that he’s been looking here for awhile, telling everybody “nobody’s claimed me yet” while adding “I’ve been looking around and like all the gals I’ve met” could be taken to mean that his views on his own desirability don’t match the ladies views. At least it doesn’t sound as if he’s gotten many résumés to go over yet and is growing a little impatient. It’s no sure thing he’s going to find any takers, but he’s not staying single without a fight. Luckily for him – and for us – he’s got a quality wingman alongside him in Eddie Woodland to help make his case to the eligible bachelorettes. 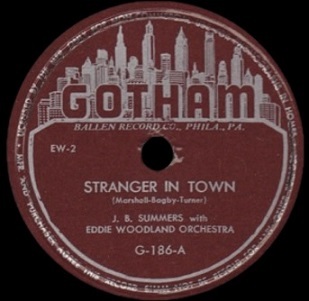 On one hand it’s hard to see how Gotham initially envisioned this as a record worthy of being attributed to Woodland, as his role here is clearly secondary to Summers, but then again not long ago Specialty Records felt that trumpeter Don Johnson’s much more modest contributions to State Street Boogie that was absolutely dominated by vocalist Smokey Lynn, somehow justified it coming out under Johnson’s name. On the other hand, as we consider the initial labeling of Stranger In Town, Woodland is certainly bringing the appropriate fire to his part in all this and so if Gotham was merely seeking to diversify their material by including a vocal performance then I suppose it was understandable. The quick re-evaluation by the record company resulting in his name subsequently being dropped is in no way a reflection on Woodland’s performance. He’s carrying a large share of the load during the mayhem on the verses and when he gets his chance to step into the spotlight – with Summers calling out to him, “Blow Eddie!” – he may start off with a more modest tone but soon starts increasing his intensity and blows the same note fifteen times (actually fifteen and a half as he breaks off the last one to segue into his crescendo) which rouses Summers into shouting out from the sidelines as the song heats up all the more. It doesn’t quite turn into an inferno, this wasn’t Big Jay McNeely we’re talking about here after all and so the lines themselves are more pedestrian by nature, but Woodland’s goal is the same and he’s successful in creating the wild atmosphere the song calls for. The drums, piano and bass are adding to general cacophony without standing out, but there’s hardly any room for them to maneuver as Summers makes his reappearance after the solo by losing control of his senses and his libido simultaneously, crying out to the girls “Ball… ball… ball, everybody!” and there’s no mistaking his meaning. This isn’t tennis, baseball or basketball he’s talking about here and before he tears off all of his clothes and shimmies naked across the floor the producers have the good sense to wrap things up before they’re all hauled in for indecent exposure and other sins involving a lack of decorum. If Summers went back to his room that night with a hard-on and no girl to share it with it certainly wasn’t for lacking of trying. He may not be subtle about his desires, either carnal or musical, but he’s at least presented his wares in the most direct way possible, something that bodes well for his ultimate chances in both venues, the bedroom and the bandstand. Furthermore it fits into the rock landscape seamlessly, which may well be their most impressive feat. For two novices at recording these guys sound as if they’ve been burning it up on the chitlin’ circuit for the last two years, holding their own against most and putting to shame more than a few who think they can compete with them. 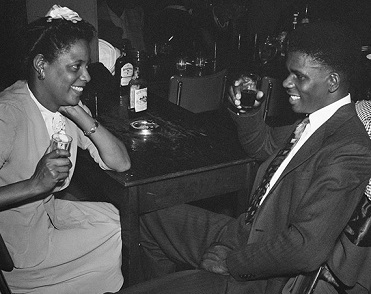 As such Stranger In Town is a song that embodies a worldview that fits right in with the post-war black community… restless, eager and confident, fully expectant that they’re in control of their own destiny at last. For J. B. Summers he had his part down fine. He gave it his all each time he stepped in front of a microphone and knew exactly what to do when the red light went on. Unfortunately the record buyers of the day didn’t always know what to do when choosing who to drop their money on and this was one of those times. Leave a reply on "J. B. Summers: “Stranger In Town”"